1. In small bowl, stir garlic, poppy seeds, sesame seeds and caraway seeds. 2.In large skillet with 2-inch-high sides, add water to fill halfway; stir in vinegar and salt and heat to a simmer. Carefully crack eggs, 1 at a time, into small cup. Slowly slide eggs into water while immersing cup slightly in water. Cover tightly with lid; remove from heat. Let stand 4 minutes or until egg whites are cooked through and yolks are slightly soft. 3.In small bowl, smash avocados and lime juice with a fork. 4.Toast bread; spread with avocado mixture. 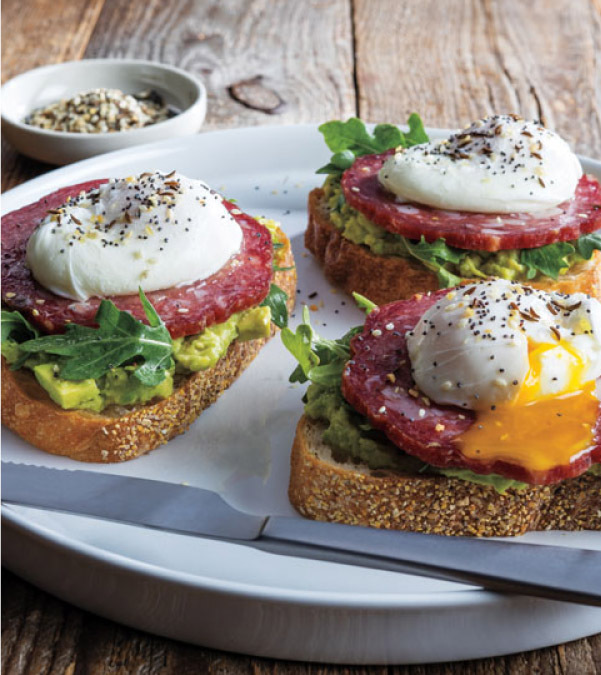 Top with arugula, salami and poached eggs; sprinkle with seed mixture.